Markham is definitely a suburb to fully understand before passing judgment mainly because this is a community that has some hardships and has a higher than average crime rate; however, it is not a highly dangerous neighborhood like most people perceive. Many judgments on this community are passed out based upon the fact that this community is over 80% African American, which is a foolish basis to judge the safety of a community especially since there are safe mostly black suburbs in Chicago land. The reason I am making a chapter on Markham is because it is one of the first Chicago suburbs to experience Chicago based gang activity and Markham has a higher than normal crime rate and heavier gang activity than most average suburbs and the national average. Markham is not an impoverished community like neighboring Harvey, Robbins or Ford Heights but there is a fair level of poverty in certain areas of the village, and that is mainly where the gangs and crime are at high levels. Many residents of Markham live well above the poverty line and so do their neighbors, in fairly safe subdivisions mostly located on the village’s north side north of 159th Street, and no I am not only talking about the 12% of the population that is white, the majority of the middle class in this suburb is black, and Markham is a community for many black middle class families that lead law abiding lives, some even have higher level professions such as doctors, lawyers and business owners. This area was formerly settled by Pottawatomie Indians leading up until 1816 when the Treaty of St. Louis was signed by the natives. Settlers from the east coast began settling here in the mid-1830s and had scattered farms. In the 1840s and 1850s decade more settlers arrived that immigrated to the United States from Germany and Ireland and built their homes on this land. In the first decades of the 20th century more settlement came to this area as many people were drawn to the heavy industry in neighboring Harvey and soon the population grew to about 350 people by 1930. 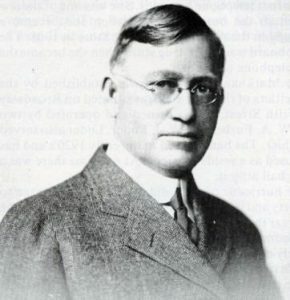 The area was finally incorporated and given the name Markham in 1925, named after Charles H. Markham (pictured) the President of the Illinois Central Railroad. After World War II, Markham experienced a population boom as new subdivisions were platted and the population grew to over 11,700 residents by 1960, 21.4% of which were black residents. Black residents began moving into the community in the 1950s decade as Markham was growing; therefore, the black residents were not simply taking over old houses previously owned by white people, instead they were helping build the community, this helped create higher levels of racial harmony compared to many other south suburbs. In the 1960s, the city of Chicago and nearby suburbs were experiencing racial disharmony, especially in Harvey where riots and fights were occurring but Markham managed to avoid most of these racial conflicts; however, Markham could not avoid the arrival of Chicago based street gangs. In the year 1968 the Black P Stones invaded the south suburbs and one of those suburbs was Markham. Within a short amount of time the Black Gangster Disciples also arrived in the suburb which were a rival of the Black P Stones, both gangs were set out to recruit young black males into their armies. The Markham community was first awakened by gang violence when a United States Army veteran was gunned down and left paralyzed by the Black P Stones on September 1st, 1970. On this day U.S. Army veteran Michael Weaver was visiting with family all day on August 31st. Later in the evening Willie Weaver, the younger brother of Michael said he wanted to talk to his brother outside, and outside was Willie Thompkins, Glenn Lee, Fred Miller and another Black P Stone named Stringfellow. The men wanted to talk to Michael Weaver because there were rumors that Michael tricked on the Black P Stones to the Markham Chief of Police, they suspected him because after Weaver went away to serve in the U.S. Army in 1967 to participate in the Vietnam War he decided he longer wanted to be a Black P Stone member which he joined in the year 1964, he was then treated differently by other Stones, and now he was suspected of being an informant. The men sat him in the back seat in the middle and interviewed him, and Weaver continued to tell them he did not inform on anyone in the nation. The men then drove to the intersection of 160th and Gauger in Harvey (Was considered Markham back then) then stopped the car. All the men got out accept Willie Thompkins and Michael Weaver, Thompkins then put his hand on his chest then saluted a clenched fist and shouted “All power to the Black P Stones!” then fired his gun into the chest of Weaver who then ran out of the car as Thompkins kept shooting firing two more shots, one of them struck Weaver’s hand, then Weaver played dead. Weaver survived the shooting but was paralyzed from the waist down; the shooters were all arrested and convicted but given light sentences (People vs. Thompkins, 1974). Weaver dragging himself basically by his fingernails to a nearby house calling for help but no one heard until he used a can to scrape the concrete to attract attention. When being driven by the attempted killers Thompkins kept on saying “What are you doing wrong?” to Weaver, then he told Weaver he was “Flaky” shortly before shooting him. Thompkins was a cold blooded killer and was free on bail at the time of the shooting for shooting a pizza delivery man to death while trying to rob him in Markham (Chicago Tribune page 4, January 8, 1971). Thompkins must not have been convicted of the murder of the pizza man, and only spent less than five years in prison for the attempted murder charge, and then in 1980 he was arrested and convicted of a double murder in Markham. Markham had white gangs and black gangs in the 1970s that used to fight it out in the streets especially in the communities’ south side area, when most white residents moved out Black P Stones and Black Gangster Disciples took over Markham, both gangs would develop a stronger influence over time in the suburb. On the date of September 7, 1983 a truly shocking murder happened in the suburb of Markham when 40 year old John F. Thomas was walking down the street at 160th and Wood when he was approached by 8 members of the Black Gangster Disciples and told to hand over his wallet, when Thomas refused the gang viciously beat him until he was dead. The gang members then took his wallet but only found $2 in there, the 8 of them then went to the liquor store and bought a six pack of beer (Chicago Tribune Page 3, November 16, 1984) (Chicago Tribune Page 6, January 10, 1984). Markham would experience higher than normal levels of gang violence for many more years to come and still has higher levels of crime especially south of 159th Street. Over the years Markham has always had a strong presence of Gangster Disciples and Black P Stones since the 1960s. Since the 1980s or 1990s Markham has also had Four Corner Hustlers.